Krosno Odrzańskie [ˈkrɔsnɔ ɔˈdʐaɲskʲɛ] (German: Crossen an der Oder) is a city on the east bank of Oder River, at the confluence with the Bóbr. 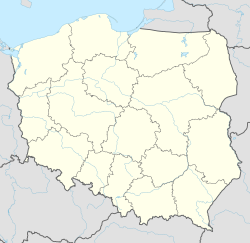 The town in Western Poland with 12,500 inhabitants (2002) is the capital of Krosno County. It is assigned to the Lubusz Voivodeship (since 1999), previously part of Zielona Góra Voivodeship (1975–1998). The town was first mentioned as Crosno in 1005, when Duke Bolesław I Chrobry of Poland had a fortress built here in the course of his armed conflict with Emperor Henry II and the West Slavic Veleti confederation. Due to its strategic location as a point of passage across the Oder, it played an important role at the western border of the Polish kingdom with the Holy Roman Empire during the 11th to 13th centuries. In 1163 Krosno was part of the Duchy of Silesia ruled by Bolesław I the Tall of the Silesian Piasts at Wrocław. In 1201 it received its town charter by Bolesław's son Duke Henry I the Bearded. Henry erected a stone castle at Krosno, where he died in 1238 and where his widow, Hedwig of Andechs, took refuge during the 1241 Mongol invasion of Europe. When the Duchy of Wrocław was finally divided in 1251, the town became part of the newly created Duchy of Głogów under Konrad I. The town changed hands several times; once it was given as payment to soldiers of the Ascanian margraves of Brandenburg. When the last Piast duke Henry XI of Głogów died without issue in 1476, his widow Barbara of Brandenburg, daughter of Elector Albert Achilles of Brandenburg, inherited the territory of Crossen. The Brandenburg influence met with fierce opposition by Henry's cousin Duke Jan II the Mad of Żagań, who devastated Krosno but in 1482 had to sign an agreement with Albert Achilles, who was able to retain the Krosno area. As a former part of the Duchy of Głogów it officially remained a lien of the Bohemian kingdom until in 1538 King Ferdinand I of Habsburg, renounced all rights to Crossen in 1538, thereby finalizing the district's belonging to the Neumark region of the Brandenburg margraviate. With Brandenburg Crossen became part of the Kingdom of Prussia in 1701. In reforms after the Napoleonic Wars, the town became part of the Province of Brandenburg in 1815. In May 1886 the town was devastated by a whirlwind. In 1945 during World War II, the town was conquered by the Soviet Red Army. According to the post-war Potsdam Conference, the town east of the Oder-Neisse line was placed under Polish administration. The German-speaking inhabitants were expelled westward for Poles to take their place. Due to war and expulsion, the population was reduced from 10,800 in 1939 to 2,000 in 1946. ^ a b c Chisholm, Hugh, ed. (1911). "Crossen" . Encyclopædia Britannica. 7 (11th ed.). Cambridge University Press. pp. 509–510.